TTN, 9th April 2015: The proponents for and against penalty rates were out swinging Tuesday after the Easter 2015 long weekend, particularly in Victoria where Melbourne’s retail precincts were, for the first time, closed to shopping tourists after the Victorian government gazetted Easter Sunday as a public holiday. In NSW and the ACT, a business group produced posters apologising for holiday closures forced by penalty rates, whilst Queensland, heavily dependent on tourism and hospitality, continues to look at South Australia’s landmark industrial relations changes to rates brought on just a few months ago. The aggregated stories here are listed in reverse chronological order, and the South Australian deal is included. A campaign to raise awareness of the high penalty rates paid to workers over the Easter long weekend appears to have backfired for some Newcastle businesses. 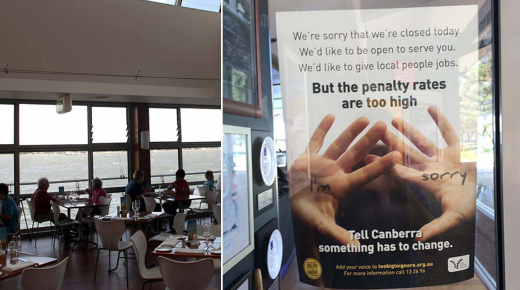 Several cafes and restaurants displayed posters apologising for being closed over Easter, saying they simply could not afford to pay staff penalty rates and urging them to lobby Canberra for change. An ABC listener, Erin from Cooks Hill, said she has cancelled a wedding party at a local restaurant that displayed the poster. “Well, I think it’s appalling,” she said. Erin said the extra rates are the only reason she can afford to eat there. “I just found it very offensive,” she said. The ABC contacted the restaurant, but the owner has declined to comment. I HAVE worked in the hospitality industry for over eight years and have never expected penalty rates (‘‘Topics: Serving up blame over penalty rates’’ Herald 7/4). It is no secret that the hospitality industry requires you to work nights, weekends and public holidays. It’s all apart of the deal, it’s what you’re signing up for. Why should I be paid $40 an hour on a Sunday evening (plus more on a public holiday), for unskilled labour such as pulling beers, polishing glasses and cleaning tables? It’s ludicrous to work in the hospitality industry and expect penalty rates when their removal ultimately benefits the customer. Although customers will see major benefits such as lower prices and being able to purchase goods and services when it suits them, employees will also see benefits such as higher customer turnover, resulting in more shift opportunities. The removal of penalty rates would also provide more employment opportunities for the unemployed, which will help the current unemployment issue in Newcastle. Scratchleys put up this sign to explain why it did not open during the Easter long weekend. DID you notice the posters during the Easter long weekend? ‘‘We’d like to be open to serve you. We’d like to give local people jobs. But the penalty rates are too high,’’ they read. Without making a judgment either way, it seems fair to say that, as far as campaigns go, the Australian Chamber of Commerce and Industry’s campaign bemoaning penalty rates on public holidays and Sundays was a hard sell. Just ask Scratchleys on the Wharf, one of the businesses in Newcastle that slapped the sign up on its doors at the long weekend. The upmarket restaurant’s Facebook page was flooded with comments criticising the move, one person writing that the restaurant could ‘‘expect a backlash from those who support penalty rates’’. The critics weren’t exactly silenced when the restaurant responded that the closure was in fact the result of a unanimous staff vote. It prompted the inevitable line of questioning: Was it the penalty rates? Or was it the staff’s decision? We asked Neil Slater, the restaurant’s owner, to clarify but, after a relaxing Easter weekend, he said he’d rather not get involved in the debate. HUNDREDS of shops and restaurants across Melbourne shut down to avoid paying spiralling penalty rates yesterday. Small business owners warned the exorbitant costs resulting from the declaration of Easter Sunday as a public holiday would derail the economy. The Andrews Government decision means employers are required to pay permanent staff double time and a half per hour — a 150 per cent increase. Casual staff get double time and three quarters. Previously, staff were paid the normal Sunday double-time rate. 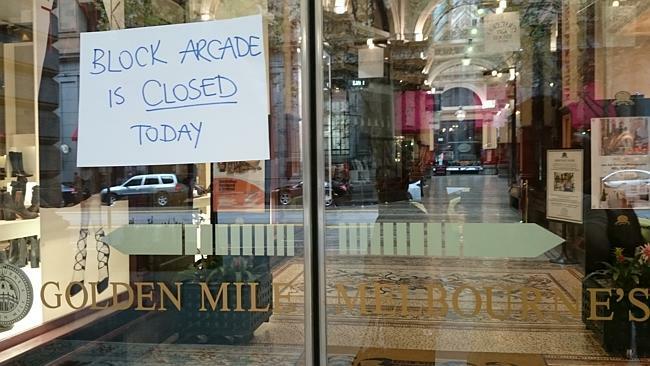 ALL of the stores inside the Block Arcade were closed. MORE than one third of the shops were not open on Degraves St (between Flinders St and Flinders Lane). ALMOST a third were also closed on Collins St (between Swanston and Elizabeth streets). Half of those had signs saying it was due to Easter. LYGON St had at least 15 businesses shut while Chapel St had 38 closed (between Toorak Rd and Dandenong Rd). This year was the first time public holiday penalty rates applied for Easter Sunday. Chief executive of the National Retail Association Trevor Evans warned it was bad for business, consumers and the economy. “The reality is it has become more economically viable for retailers to close on public holidays rather than wear the astronomically high penalty rates,” Mr Evans said. 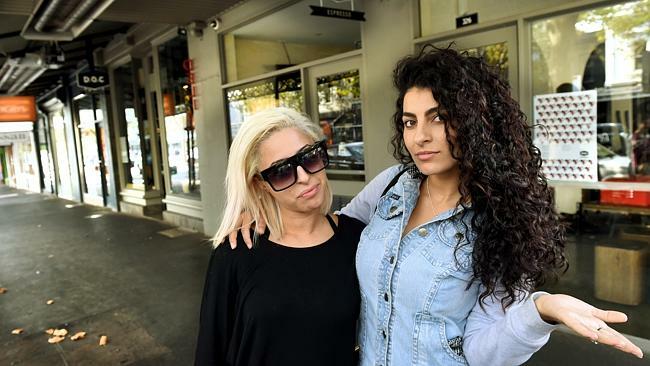 Friends Sabrina Mitwali and Mirna Touqan flew from Sydney to shop in Melbourne. “We went into the heart of the CBD, Collins St, Bourke St and most of the little stores we wanted to go to were all closed,” Ms Mitwali, 24, said. Co-owner of Toto’s Pizza House on Lygon St Serge Mazloumino said he was turning over as little as $500 on public holidays. It was a similar sentiment shared by the president of the Smith Street Business Association, Howard Frederick, who said the Government’s decision to make Easter a public holiday was a “slap in the face”. While some sections of the city were shut, other parts had solid crowds, especially around the major retailers. Victoria has the highest number of public holidays in Australia. Minister for Small Business, Innovation and Trade Adem Somyurek defended the move, saying those who worked on the holiday should be properly compensated. “Easter Sunday is a time to spend with family, friends and loved ones. This is about making it fairer for those who have to spend that time at work instead,” Ms Somyurek said. THE Australian Chamber of Commerce and Industry has launched a national ­campaign to fight madcap penalty rates that will allow teenagers to earn $50 an hour to serve tables over the Easter long weekend. Dozens of restaurants and small businesses in Sydney will close for the whole long weekend because it is too ­expensive to pay junior staff $350 a day. Those businesses have been asked to put glossy ­posters in the shopfronts ­urging the federal government to change penalty rates. The closures will affect employees, who will earn nothing this weekend despite being prepared to work at lower penalty rates. Businesses are not allowed to pay lower rates. Unions across NSW ­yesterday launched vicious campaigns against the ACCI and small business owners who are closing their stores. A Facebook page has been started to “out” businesses who are closing and calling for penalty rates to change. The laws, which mean pay rates at least double across ­tomorrow, Saturday, Sunday and Monday are crippling businesses and workers. ACCI chief executive Kate Carnell said the existing ­enalty rate arrangement was a “lose-lose” situation. “Customers lose because the services they want are harder to access, staff lose ­because they don’t get the hours many are seeking at work and business proprietors lose because they get ­little benefit from the holiday traffic,’’ Ms Carnell said. Ms Carnell said businesses were happy to pay incentives for employees to work ­weekend and public holidays, but said the existing penalty rates were outdated. “A casual retail shop ­assistant or fast food ­employee is paid a minimum of $50.94 an hour on public holidays,’’ Ms Carnell said. Federal Small Business Minister Bruce Billson is ­consulting employers to look at potential compromises. Mr Billson declined to comment yesterday. A landmark agreement was struck in South Australia last month which would ­reduce penalty rates on ­weekends in return for higher base pay rates. Business groups believe there needs to be nationwide uniformity in the laws. 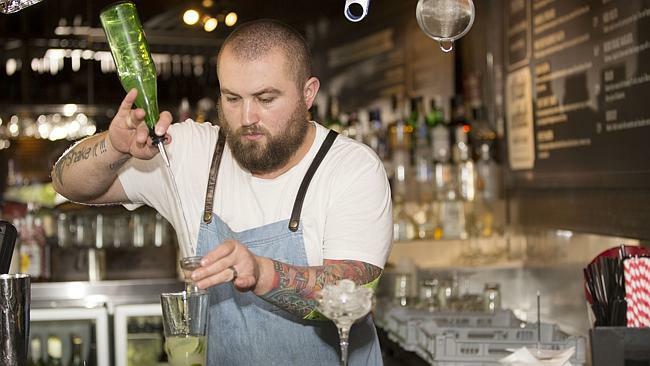 BARMAN Jakob Gaykowski has worked around the world for 14 years but only in Australia has he taken home penalty rates. 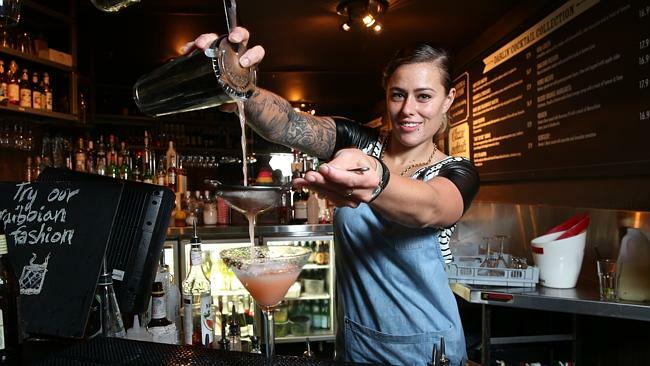 This weekend the 29-year-old will work 17 hours at Li’l Darlin in Surry Hills and says the higher pay will make the hard work seem a bit easier. “It’s harder work on holidays, so the more payment means I can swallow the pain,” he said. Queensland’s leading business lobby group claims three of the state’s key industries are suffering under the current penalty rate system, but unions say there is “no appetite” to change it and the government, for the most part, agreed. The South Australian Shop, Distributive and Allied Employee Association signed off on a landmark deal with Business SA to slash weekend penalty rates, in exchange for a higher base rate of pay. The agreement, which is voluntary, is being held up as a template by other employer groups. Chamber of Commerce and Industry Queensland general manager of advocacy Nick Behrens said the state’s employers needed to see penalty rate reform. “Retail, tourism, hospitality, they are the areas of the service economy which have the most frustration with the existing penalty rate framework,” he said. “Our research demonstrates that employers are reducing their hours of operation, they do this in hospitality, they can’t do it so much in the area of retail, but what they are doing, is reducing the hours of employment offered. But Mr Behrens said it was proving difficult to get the conversation started in Queensland. “The interesting thing is that the unions went to ground,” he said of Tuesday’s South Australian announcement. Queensland Council of Unions president John Battams said he shouldn’t expect to. “I have canvassed a range of affiliated unions in Queensland and there is absolutely no appetite for any change to the current arrangements around penalty rates,” he said. “They put food on the table and make a real difference for many hundreds of thousands of Queensland workers and should not be traded away. “Whether you are a nurse, a firefighter a retail or hospitality worker, if you work nights or weekends, we believe you should get compensated for that and that’s what our community supports. The new state government concurs. “The Queensland Government has made its position on penalty rates clear,” Treasurer Curtis Pitt said in a statement. “We think penalty rates should stay because they compensate workers for working on the weekend. A review into the nation’s penalty rates is underway through the Productivity Commission. But Mr Behrens said the South Australian agreement had paved the way for an easier change. “Our view is it is a national award, so irrespective of it being in South Australia, or anywhere else, it doesn’t make any difference,” he said. WEEKEND penalty rates are set to be slashed in South Australia’s retail sector after a landmark agreement between the shop assistants’ union and Business SA. In a deal that will see the end of Saturday penalties and the halving of those paid on Sundays, retail workers will be offered higher base rates of pay and improved conditions. These include the right to refuse weekend work on Sundays and public holidays. Sources have confirmed the breakthrough to The Advertiser and it is understood it came about after the Shop Distributive and Allied Employees’ Association approached Business SA, which represents the retail industry as well as other small business in South Australia. SDA Secretary Peter Malinauskas hailed the deal as a breakthrough for industrial relations in the SA retail industry, saying it represented how IR should work, with unions negotiating with business to deliver outcomes that suited both employees and employers. “The SDA has now come to a sensible alternative with Business SA to allow small retailers to easily approach the issue of penalty rates without reducing them in modern awards altogether, which would result in a pay cut for thousands of workers,” he said. The burden of weekend penalty rates has long been seen as a disincentive to small retailers opening longer or staying open on weekends and it is hoped the deal will stimulate the struggling retail sector, while also generating more economic activity and potentially creating more retail jobs. The template agreement signed between the union and Business SA can be adopted by small businesses if agreed to by employees, and would apply to about two-thirds of the state’s 60,000 retail workers in small and medium-sized businesses. It reduces penalty rates for Sundays from a 100 per cent loading to 50 per cent, cuts public holiday rates from 150 per cent to 100 cent, and abolishes penalty rates on Saturdays and weekday evenings. In exchange, workers will receive a higher base wage, a guaranteed annual pay rise of 3 per cent, and an unprecedented right to refuse to work on Sundays and public holidays. It also gives permanent workers the right to every second weekend off. For a full-time shop assistant, the base rate of pay would jump by 8 per cent from $703.90 a week to $760 a week. At workplace level, the deal would still require signed agreements to ratified by the Fair Work Commission. “If business wants to make changes to penalty rates, then employers should negotiate an agreement using enterprise bargaining in the same way the SDA has been negotiating with employers over two decades,” Mr Malinauskas said. He said the deal would provide employees “significantly higher base rates of pay, guaranteed yearly decent pay rises and better breaks and rostering provisions”. “While the agreement is 100 per cent voluntary, the SDA is hopeful local retail businesses will take up this opportunity to have a proper workplace agreement that reflects the specific needs of their business and their employees,” he said. 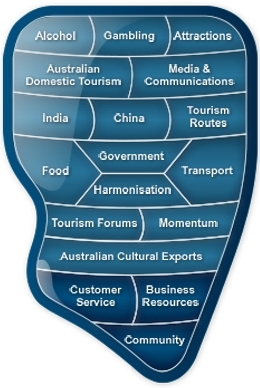 The national Australian Chamber of Commerce and Industry has said that the deal could be replicated across Australia.